I just loop it round my neck once, done. If I have it because it was cold earlier or will be but don't need it now, just draped around neck. If it's a bit cold, fold in half and pull through loop. If it's colder, I loop around neck then knot. If needed I pull the looped portion over my face. Never worn a scarf. I always use a shirt with the long neck thing, or a coat. My neck is safe from the cold with those two methods. I wear a motorcycle face warmer. 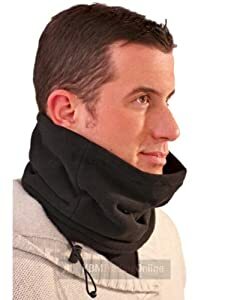 Keeps my neck warm, or stretch it up over my face. A scarf interferes with my hood. I've never worn one for style or weather. but I would do it same as you, flip, done. Either around my neck once or just let it hang down on both sides. Scarves are for anime characters and petite women. Home > Fashion & Beauty > How do you like to wear your scarf?